Love necklace inscribed in 24k gold with I love you in 120 languages, encompassing a backdrop of a golden heart! The I Love You necklace is beautifully inscribed using innovative technology, allowing us to write tiny text under the surface of the gemstone. The stylish black round onyx measures 0.6x0.8 inches, 15x21mm and is prong set in your choice of metal frame while elegantly resting below the graceful lines of the 925 sterling silver or gold filled chain, 18 inches, 45cm. The romantic necklace is set in a 925 sterling silver or gold plated cameo style round frame setting of your choice and measures 0.9x1.15 inches, 23x29.5mm including the bail. The 925 sterling silver frame beautifully suspends from a 925 sterling silver rolo chain, while the gold plated frame suspends from a gold filled rolo chain. If you can't say it enough, say it in 120 languages! A romantic anniversary gift idea for any loved one; wives, girlfriends, best friends, mothers or a special treat just for you! 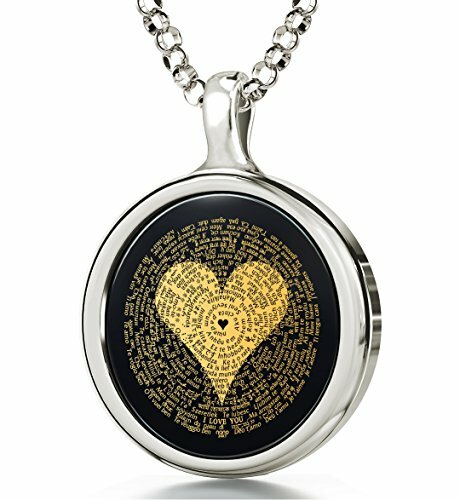 Love necklace inscribed in 120 different languages over a heart backdrop in 24k gold onto a round black onyx gemstone, measuring 0.9x0.15 inches, 23x29mm, set in a 925 sterling silver cameo style frame, including the bail. The I Love You necklace arrives on an 18 inches, 45cm, high quality, traditional Italian made 925 sterling silver rolo chain. See all 120 languages with the help of an elegant magnifying glass, included with every purchase! Sterling Silver 6.5-7mm 3-rows White Freshwater Cultured High Luster Pearl Necklace, 18"
JewelExclusive Sterling Silver 1/2cttw Natural Round-Cut Diamond (J-K Color, I2-I3 Clarity) Oval X/O Necklace, 17"